Dubai: A “high-security” and “untamperable” Philippine passport was unveiled here Monday, featuring famous landmarks and a promise to curb delays in the issuance of new e-passports. Philippine Consul General to Dubai, Paul Raymund Cortes, unveiled the new design, highlighting its “visually striking” features, and touting it as one of the “most secure passports” in the world. The e-passport will arrive in Dubai over the next 10 days, he said. "This new e-passport has new security features that make it un-tamperable and avoiding the risk of forgery, thereby increasing the respect for the Philippine passport," Cortes said. The new document contains a range of security features — such as holographic images that can be seen from a certain angle and an upgraded security feature of the microchip to capture the applicant’s personal data. Security inks were also used to print the passports to prevent forgery. These inks include intaglio, which are visible inks that have a distinct ridged feel and ultraviolet ink that appears when exposed to infrared lights. Other security features include watermarks, perforated passport numbering, embedded security fibers, among others. Cortes said the incidences of having fake passports in Dubai are "few". But he said having the new e-passport will make it "extremely difficult" for forgers to create their own. Consulate officials busted three cases of fake documents in Dubai in May, including a fake passport. But Cortes clarified that the fake document was sourced in the Philippines. Cortes said he will officially present the new e-passport specimen to the UAE Ministry of Foreign Affairs in the coming days. Cortes clarified that residents holding the current e-passports do not have to worry as the passports they are holding are still valid until its expiry. The new government of Philippine President Rodrigo Duterte has promised to speed up the production the new passports by up to 35 percent to make it readily available to Filipinos and do away with serpentine queues at passport application centres, especially in the provinces. Duterte, in his first state-of-the-nation address, had also proposed to Congress amendments to the passport law by increasing the validity of Philippine passports from the current five years to 10 years to ease passport renewal woes endured by millions of overseas Filipino workers. Around 10 per cent of 104 million Filipinos work and live overseas. On Monday, the Manila government also unveiled a one-stop shop that brings together the services of 14 government agencies — including the Department of Foreign Affairs, Overseas Workers Welfare Administration, Tesda, the Pag-Ibig Fund, Professional Regulation Commission, PhilHealth, Social Security System— under one roof. For science and history geeks, the new 44-page passport is a sight to behold. " You'll love going through each of the pages. It features the famous landmarks such as the Ifugao Rice Terraces, Mt Pinatubo, Mt Mayon, the Mangunngul Jar, among others," said Philippine Consul Ferdinand Flores. The Manunggul Jar is a burial jar found in Quezon, Palawan that dates back to the Neolithic period or the 9th Century. 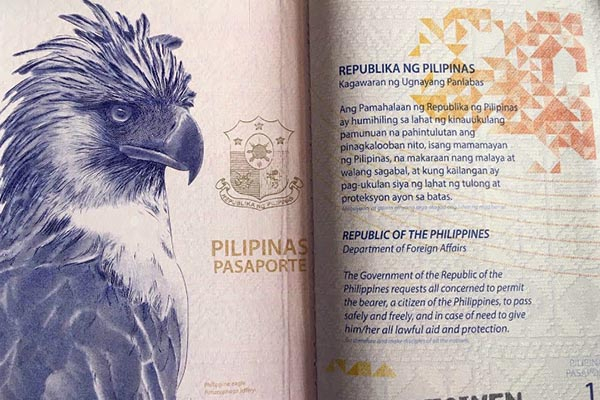 At the back of the passport cover features the Philippine eagle along with the wings of the critically endangered Philippine cockatoo. The lines of the Philippine National Anthem are displayed on each of the page. Officials said the passport cost is still Dh240. Printing of passports is faster at just five to seven days but delivery to Dubai could take more than a week as printing is done in Batangas, Philippines. Officials said it could take roughly two to three weeks for passports to be delivered in overseas posts like Dubai — a dramatic improvement from eight weeks in the past.